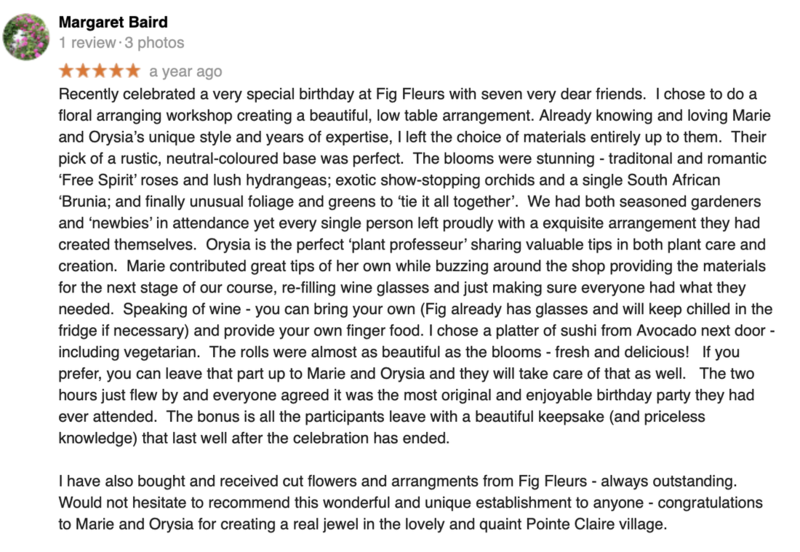 To visit Fig fleurs in Pointe-Claire village is to fall under the spell of flowers and the impeccable taste of its owners Orysia Krywiak and Marie Vallée. Before you even enter the store, your attention is drawn to the exquisite flower boxes and eye-catching outdoor arrangements. The you step into an open space filled with natural light. In the windows and shelves is an assortment of stunning plants and flowers (both fresh and dried) hanging and standing in equally beautiful pots. You see the work of creative minds everywhere. There are arrangements in progress: An assortment of interesting greenery and cut flowers in water-filled containers under the work table, finished arrangements of cut flowers combined in artful ways or standing alone in a perfectly chosen vase, and exotic decorative pieces chosen to complement the organic beauty of flowers. The obligatory florist's refrigerator is filled with unusual flowers not just set on a shelf but displayed to advantage on different levels. You get the impression that no detail has been overlooked, that the people who spend their days here love their work and are no strangers to the magic of flowers. At our November meeting, Orysia talked about using plants to decorate for the Holiday season while creating an arrangement that was given as a door prize. ​It was a beautiful night.